Fine art, Illustration, graphic design and the art philanthropy of Sam Morrison: Curves for Men? 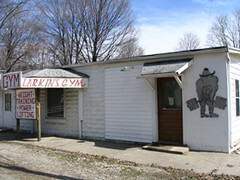 We've all heard of Powerhouse Gym, Gold's Gym, Curves for Women but, Larkin's Gym? Looks like another fitness franchise looking for your monthly membership dollars. 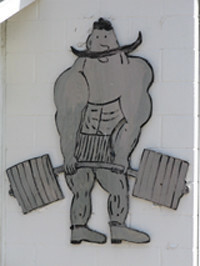 I love their "old school" logo of the muscle man. What guy wouldn't want a handlebar mustache and club feet.